"I’m interested only in research. I’m interested in science, and in helping the American public understand what the hell is going on. " 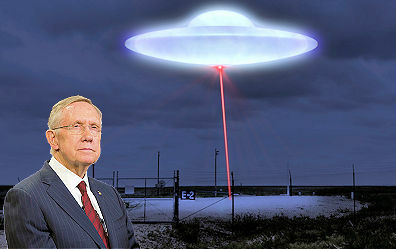 Yesterday, we outlined thirteen reasons to take recent reports of UFOs and extraterrestrial life seriously, including a chat with former Senate majority leader Harry Reid about the government’s research into the topic. Here, an extended version of that conversation. Hi, this is Eric Benson from New York Magazine. Hi, Eric. Why do you want to talk to me? Well, because of the New York Times article and the program that you helped bring about. Well, I’m happy to talk to you. Just let me preface this by saying this, if we’re here to talk about little green men or stuff that you want to look at that was found in New Mexico or something, I’m not interested. If you’re here to talk about science, I’m happy to do that. I’m really glad to do that. I’m glad somebody is interested, because it’s a subject that is being terribly neglected, so I’m happy to talk to you.